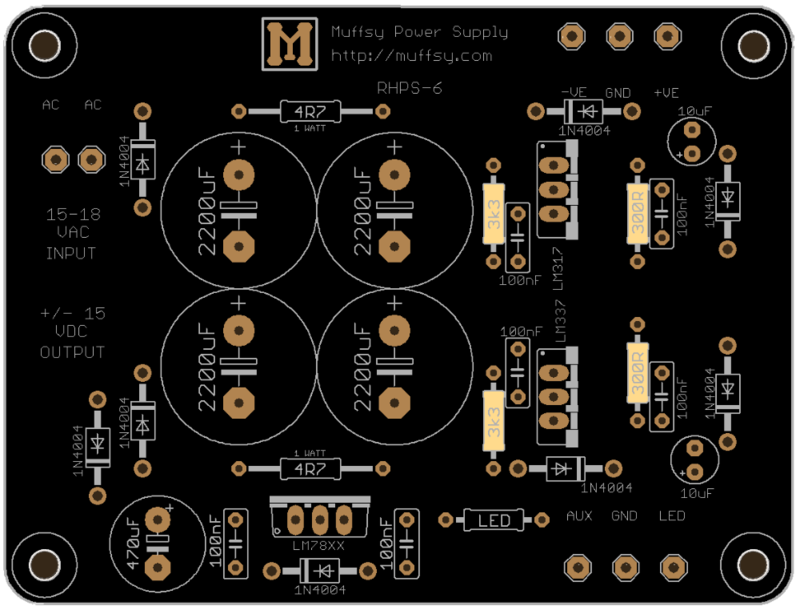 The output voltage of the Muffsy Hifi Dual Power Supply can be changed to suit your needs. Let's have a look at how this can be done, and how to make sure that your transformer is able to deliver sufficient voltage. With the resistors at 3300 ohms, the power supply will deliver +/-15 volts DC. You might want less than +/- 15 volts. Let's say +/-12.5 volts. Or more, for instance +/-17.5 volts. These output values are well within reach using the recommended 15-18VAC wall adapter. Other output voltages are easily obtainable, just use a calculator such as this one. The R1 value to provide in the calculator is 300 ohm. The PSU needs a higher input value than the desired output value. Then how can a 15 volt AC-adapter be sufficient for 17.5V output? You could actually use a 12V AC-adapter. But, there is the possibility that an adapter rated at 12V will give less than that. Stick with 15V or more, and you can be sure that your PSU works as expected.